The Art of Naming: Nolan, Theodore or Nathaniel? Plus, Unusual Middle Name Ideas! Nolan, Theodore or Nathaniel? Plus, Unusual Middle Name Ideas! Sometimes parents are attracted to more unusual names but they don't wish for it to be the first name that their child goes by on a daily basis. 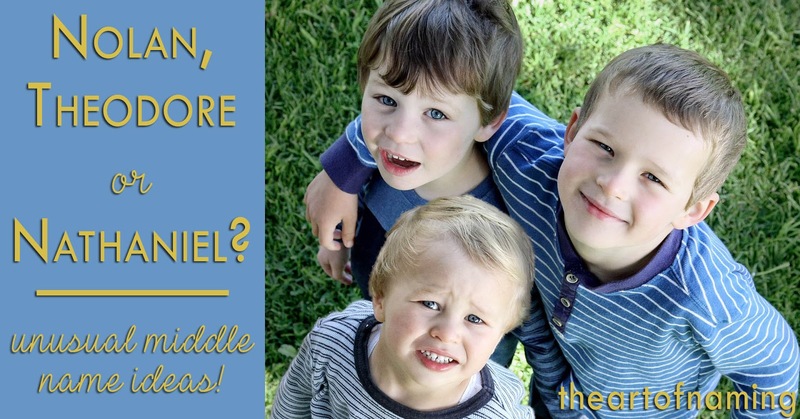 Here are three common first names for boys that have been paired with more unusual choices in the middle name spot. This way, you can have some familiarity with your uniqueness and the child can choose which one suits them better. Nolan is derived from an Irish surname Ó Nualláin meaning "descendant of Nuallán", which itself came from nuall meaning "noble, famous". Nolan dates back on record to the 1880s, but held steady for decades at a similar popularity. It started increasing in the 1990s, and entered the Top 100 in 2011. As of 2017, it ranked at #67. Theodore means "gift of god" from the Greek name Θεοδωρος (Theodoros). It has always been in use in the US for boys. In particular, it enjoyed extra popularity from 1912 through the 1960s before declining a bit. However, around the mid-2000s, it regained popularity and has really skyrocketed in the past few years. Its current highest peak ever took place in 2017 with nearly 6,000 male births and a rank of #62. Nathaniel is the most common spelling but it comes from Nathanael which was the spelling used in the Old Testament (if not Nethanel or Nethaneel). They come from the Hebrew name נְתַנְאֵל (Netan'el) meaning "God has given". Nathaniel dates back to 1880 in the US, whereas Nathanael wasn't used until 1915. Nathaniel had a popularity peak from the 1940s through the 1960s before it really started to climb, joining the Top 100 in 1978. It received the most births ever in 2002 and ranked at #62. In 2017, it rests comfortably at #112, (Nathanael at #647). Which would you choose? Can you think of more middle names that would be interesting choices for a modern boy?